If I was honest with myself, the third child idea was more about getting all the things out of child-rearing that I didn't get the first two times around, namely a girl and the means to dress her well. Having an imaginary child is one of the better decisions of my life. Around the time that I conceived her, my husband and I were trying to decide whether to have a third child or not. And since both my kids and my eggs were getting older, a decision needed to be made. We'd had our first two in our twenties, neck-deep in full-time work, graduate school, and not much money to our name. I had a bit of a romantic fantasy about having a third child under better circumstances like steady jobs and more square footage. I'd walk past the little girls' clothing section in stores and get a pang in my ovaries. Was this a sign? One afternoon we were attending my older son's middle school basketball game. I sat near my friend Marianne whose son was playing for the other team. We were newish friends at this point, but I enjoyed her quick laugh and her straight-shooting manner. While we were visiting and cheering on our middle schoolers, Marianne was deftly wrangling her two little boys, ages 2 and 3. One dropped his sippy cup under the bleachers, the other was demanding more goldfish crackers. At one point, both of them were writhing on the gym floor, unhappy with each other, life in general, and overdue for a nap. I believe one of the sippy cups had been thrown at the other's head. They were so adorable. "They're so adorable," I said to her. Or maybe my ovaries said to her. "They're just so cute," I said. Then, to explain myself, "We're trying to decide if we want another one." Suddenly Marianne was transformed. Her previously frazzled and semi-distracted state transformed into the stillness and clarity of an oracle. She looked me square in the eye. "Don't. Do. It." she said. "I'm completely serious," she said. "Don't do it. I'm on the other side now. I've been you, and I'm telling you, you have no idea how good you've got it." My smile faded. She was serious. "Listen," she said, "I love the little guys and I'd never trade them, but if you're really on the fence, I'm here to remind you that you've done the hard work, the diapers, the sleepless nights, the car seats. Do you really want to go back?" It was a good question, and I thought about it a lot over weeks and months after that. If I was honest with myself, the third child idea was more about getting all the things out of child-rearing that I didn't get the first two times around, namely a girl and the means to dress her well. Ultimately, I decided those weren't good reasons to have another baby. Plus, I had grown quite accustomed to sleeping through the night. It was kinda my thang. So I got knocked up on Pinterest instead. 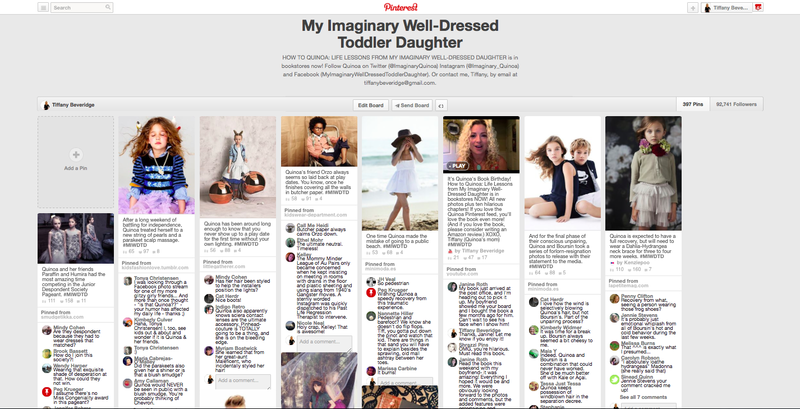 I created a Pinterest board titled, "My Imaginary Well-Dressed Toddler Daughter," and began curating the Third Child and the Third Child Life I'd wanted. I named her Quinoa. I dressed her well. And I found that it completely satiated the thirst I'd had inside. I was really onto something. And then, quite literally overnight, the world was onto me. 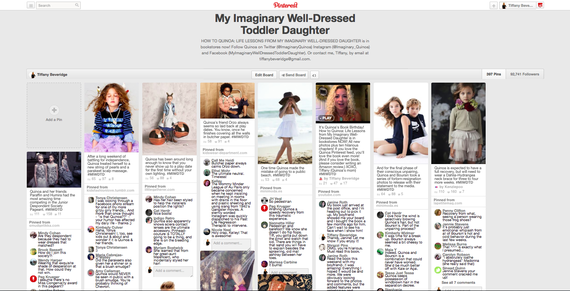 In June 2013, my Pinterest board went viral. 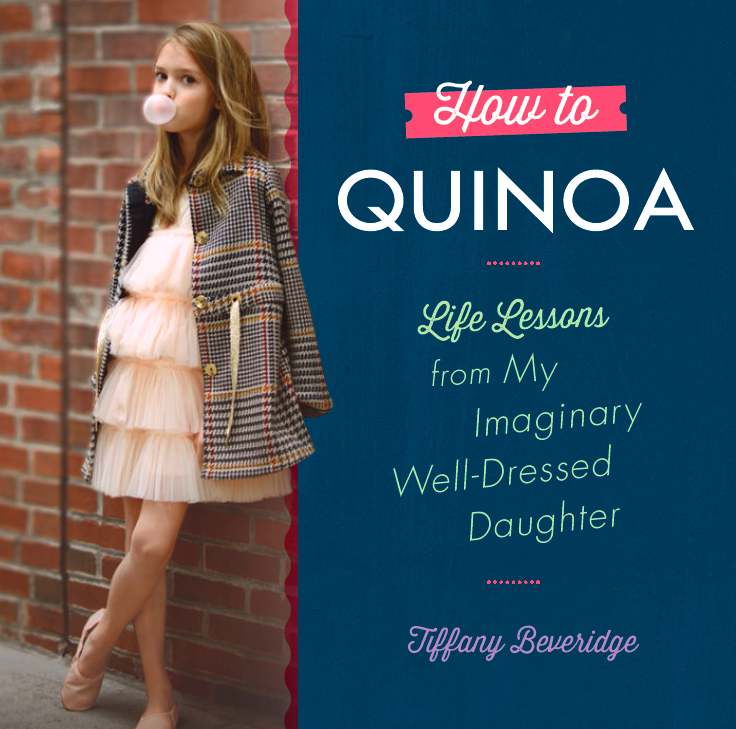 Quinoa suddenly had countless new friends all over the world. 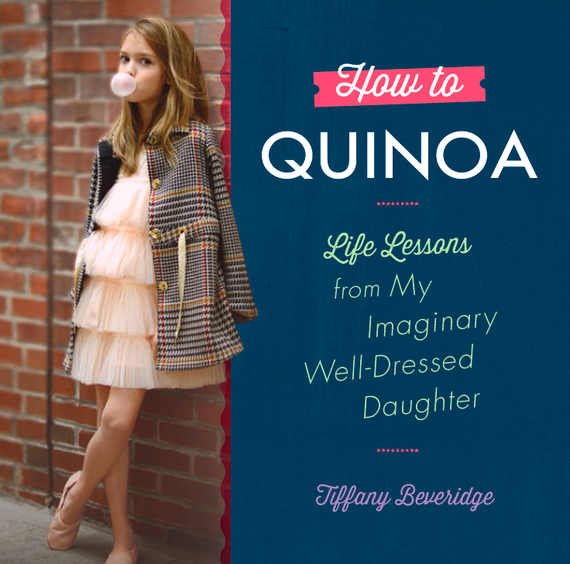 Within a few months, I had a book deal, a lifelong dream come true. And nine months after that, I held the book in my arms for the first time. I looked it over with the same wonder that I had my newborn sons. Instead of counting toes, I counted pages. They were all there. I smelled it. And just like that intoxicating newborn scent, the industrial perfume of the paper made me want to do it again and again. If I'd had another real child, I have no doubt that I'd be enjoying him or her, doing my best to live out that romanticized version I'd had in my head, but I'm glad I took the road less traveled this time. In the end, my imaginary daughter has required just as much work as my two sons. And like raising my sons, the process of bringing her to life (in book form) has taught me an awful lot about myself. What is it the Rolling Stones said? You can't always get what you want, but if you try sometimes, you just might find, you get what you need.